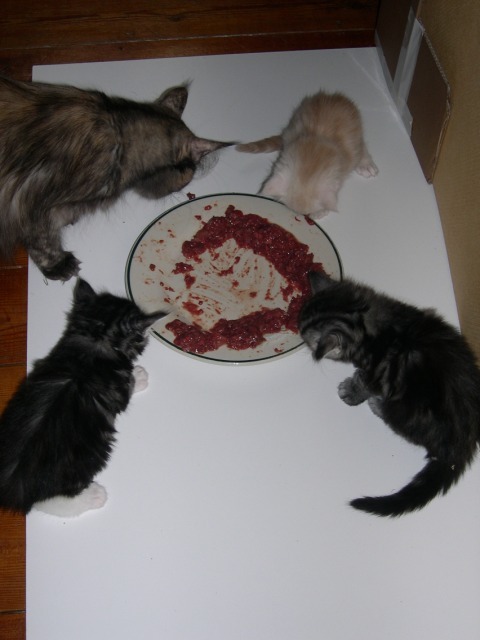 Here is a photo of the first meal I gave the kittens. As mentioned in my previous post, even though the kittens were just 4 weeks’ old, Mum Cat kept bringing them chicks to eat. Of course they were too small to even attempt to eat them, but I felt they might be old enough to attempt solids. I wean kittens onto raw meat. In this photo, they are tucking into wild rabbit mince gound with the bone, mixed with pureed offal (lungs, heart and liver) and little kitten-mouth-sized chunks of rabbit. I got it all from Woldsway Rabbit who this year have started doing offal packs – many thanks! Into this mix I add egg yolks, taurine, Vitamin E, Vitamin B-complex, kelp and psyllium husk. It is a labour of love – it is more time-consuming to have to put together a home-prepared diet rather than just open a bag of cat biscuits and pour into a bowl. From reading other breeders’ experiences, I do believe that kittens take more readily to raw food. Certainly, as you can see from the photo they seem to recognise what food is. Not all the kittens ate the raw meat in that first encounter. In the photo are Mum Cat who’s setting them an example – she frequently calls them to their food – the two boy kittens and one of the creams. I don’t try to force the kittens to wean if they’re not ready. All of them are still suckling from Mum. And the littlest cream kitten isn’t eating as much raw. However, to date all the kittens are now eating some raw.